“Everything Bridal & Everything Tuxedo in Barre brings you the convenience of having two stores under the same roof,” say owners Nathan and Aimee Ross. 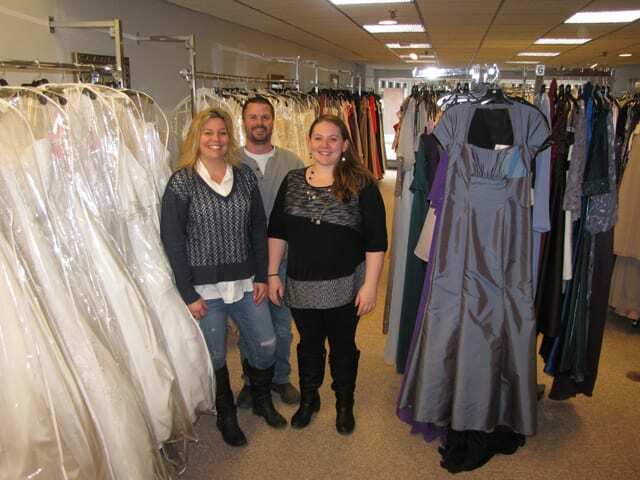 “We have a huge selection of bridal and prom gowns, as well as a full line of tuxedo and suit rentals available, which we think is a little unique to Central Vermont and West Lebanon and Claremont, NH, where our other two stores are located,” explain the Rosses. Everything Bridal opened last December at the former location of K’s Bridal on North Main Street in downtown Barre, and so far, customers are amazed at the amount of inventory and attractive layout of the store. The store also has a great line of casual dresses and accessories. “When it comes to your wedding, we have everything needed to outfit your entire wedding party, from groom to guests, fathers to flower girls,” explained Bailey, adding that they also offer accessories such as veils, jewelry, shoes and handbags. There is also a great seamstress available for all of your tailoring needs. Choose gowns from designers like Alfred Angelo and Christina Wu for your bridal party, and tuxedo or suit styles from well-known designers such as Allure Men, Michael Kors or Ralph Lauren. Everything Bridal and Everything Tuxedo is open Tuesday – Friday, 11 a.m. to 6 p.m. and Saturday, 9 a.m. to 3 p.m. It is closed on Sunday and Monday. Appointments are welcome anytime. Please call 802-476-7100 for more information.